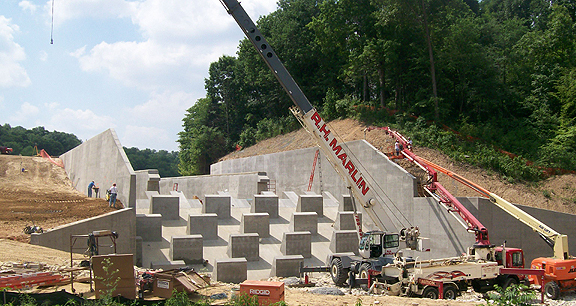 Project obstacles and solutions: Beaver Lake is a 200+ acre reservoir that serves as an emergency water source for the city of Jasper, Indiana. Built in 1955, the dam spillway was found to be inadequate to handle Probable Maximum Precipitation (PMP) in 2010 by the Indiana Department of Environmental Management. It was decided that improvements needed to be made, including the construction of a new spillway. A project like this presents several engineering and construction site challenges. For instance, the design called for a two cycle labyrinth weir wall system. These walls varied in thickness, from 2'9" at the bottom, to 1'3" at the top. Variable length wall ties were special ordered to allow for this angle. The walls also varied in height, from 12' to 27', and covered 500'. All of the forms were custom made at the site to accommodate these specifications. Each wall was topped with a customized rounded form. The labyrinth discharged over a baffled concrete spillway with a 2:1 slope. Two clean out valves were installed at the top of the walls. A secondary bypass system was constructed through the spillway abutment. Concrete mixes for this job were varied. IMI provided a total of 4,895 yards for this project. The footings, slabs and walls were specified at 4,000 psi. For the walls, IMI QC/QA used a concrete mix design to minimize any deflection of the forms and to keep rubbing to a minimum. IMI also provided a 2,500 psi lean concrete to backfill the space between the new concrete walls and the earthen embankment. imix Flexifill was used to fill the old overflow pipe, since imix Flexifill is flowable and self-leveling, it filled all of the voids. All concrete was designed to be pumped onto the site due to the restrictions of the terrain. The QC/QA staff at the IMI Huntingburg plant worked closely with Force Construction and Christopher Burke Engineering to make sure all concrete met specifications. This project was awarded a 2012 Outstanding Concrete Award from the IRMCA for Concrete Infrastructure – Stormwater Management. For more information on walls, click here. For information on flowable fills using imix Flexifill, click here.